The Phantom 4 Battery Charging Hub is designed for use with the Phantom 4 Intelligent Flight Battery. 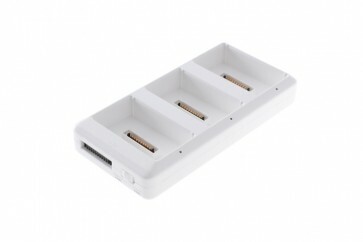 When used with the Phantom 4 Battery Charger, it can charge up to three Intelligent Flight Batteries. The Intelligent Flight Batteries will be charged in sequence according to their power levels, from high to low. Storage Mode allows the Charging Hub to keep the Phantom 4 Intelligent Flight Battery at a 50% charge, which is ideal for storage.